Gomes along with Dubai officials at the press conference in Mumbai. UAE-based Gemini Property Developers has launched a lucrative rental guarantee offer for buyers of units at its maiden Dubai project, the Dh300 million ($81.6 million) Splendor, at the ongoing Dubai Property Show in Mumbai, India. 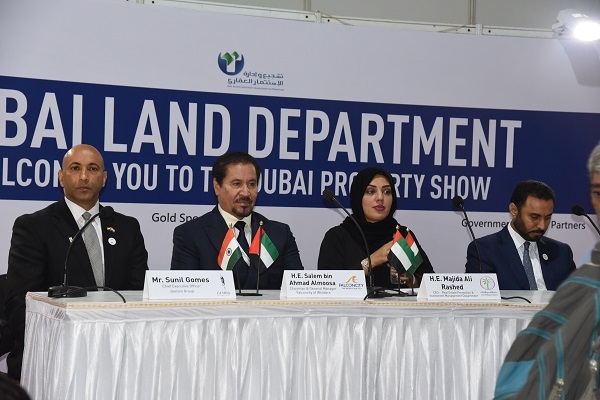 A number of UAE developers are currently participating at the annual Dubai Property Show that is aimed at tapping into the Indian investors, who have invested Dh83.5 billion ($22.75 billion) in the last five years. The three-day event is being held at Bandra Kurla Complex. Indian nationals form the largest expatriate population in the UAE and they are also the largest foreign owners of business establishments in the country, said the developer. They invested Dh15.6 billion in Dubai’s real estate last year, Dh12 billion in 2016 and Dh20 billion in 2015 – their highest in a year, according to Dubai Land Department. Indian nationals are expected to remain at the forefront of the Dubai Property Show in Mumbai – where Gemini Property Developers is launching a variety of discount offers for Indian buyers. The company will showcase Splendor located at Mohammed Bin Rashid (MBR) City, which has been recently completed and being handed over to property buyers. “India and the UAE are strategic partners – a relationship that has been cemented by back-to-back state visits at the highest level – with Indian Prime Minister Narendra Modi visiting the UAE twice in three years to take the relationship to a new level,” remarked Gemini Group Chairman Sudhakar R. Rao. “Both the countries are currently building up a US$75 billion fund that will be used for the infrastructure development in India and mostly funded by the UAE. We are happy to play our part in bringing the people, resources and wealth of both the countries much closer to create a win-win situation,”, stated Sudhakar. Gemini Property Developers CEO Sunil Gomes said: "India is a strategically important investor base for the UAE due to several reasons. While warm bilateral relations between the UAE and India go back to decades, the current momentum is unprecedented." "Foreign trade figures between the UAE and India rose from $182 million in 1982 to staggering $53 billion in 2017,' stated Gomes. "Investors in India regard Dubai based real estate options as lucrative and high yielding. The real estate market in Dubai is highly regulated, offers a very high return on investment, quality lifestyle, safe and close proximity to India. All these factors make Gemini’s properties attractive for investors," he added. Gemini, he stated, has already started handing over its maiden Splendor project with first residents already moved-in. The G+8-storey Splendor residential building spans over a built-up area of over 320,000 sq ft, which includes 134 residential units comprising spacious one, two and three-bedroom apartments, penthouses and townhouses equipped with state-of-the-art amenities. "Our offer of discounts, rental guarantees and waiving the property registration fees are demonstration of our strong commitment to the Indian market and I believe, they will like our products and our current offer," remarked Gomes. "Dubai real estate market offers a much higher and faster rental yield varying between 5-8 percent, which is hard to beat," he added. Besides the completed Splendor project, Gemini is also showcasing its upcoming G+29-storey Symphony residential project, the high-end project at Dubai’s Business Bay area, in close proximity to iconic Burj Khalifa, the Dubai Mall, the Dancing Fountain and host of other tourist attractions.